A major home improvement project is a big investment, and having a good, solid warranty can save you money should problems arise. There are typically two kinds of warranty available: material and workmanship. Material warranty covers problems that may arise from defects in the material used, while Workmanship warranty covers those that may arise from the installation process. We are among the few window, siding, and roofing contractors in Norwalk, CT, that cover both. Vinylume is a certified contractors for all the roofing, window, and vinyl siding products we install. All these are backed by strong manufacturer warranties. In addition, there’s our very own “Triple Protection” warranty. Vinylume is a certified contractor of top vinyl siding manufacturers like CertainTeed and Mastic. Each manufacturer has their own set of warranties, but it will only be valid if it’s installed by a certified contractor like us. 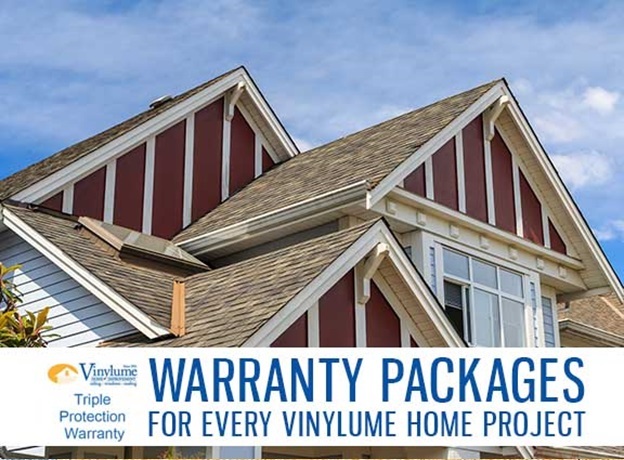 This means that no matter what siding you pick for your home, there’s a warranty to back it. GAF is North America’s largest roofing manufacturer, and Vinylume is proud to be one of the few roofers in Yonkers, NY, to be a Master Elite™ contractor. GAF’s Golden Pledge® warranty alone can cover both materials and workmanship for up to 50 years. We are a distributor of Renewal by Andersen® replacement windows and doors. This means that you are covered by the strong warranties that the brand has to offer. 1. We will service any problems that arise with products that are covered by any of the aforementioned manufacturers’ warranties. 2. We will repair any problems that arise from our own workmanship at no extra charge, for a full 20 years after the date of installation. 3. We will repair any minor damages that occur within three years of installation, again at no extra charge.